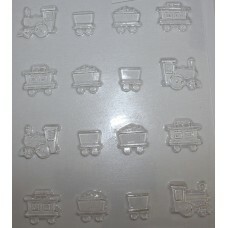 Let your imagination go and decorate this train chocolate mould to create something special for that next birthday party. Clear Plastic Mold. FDA Approved for use with food preparation. 16 Cavity Chocolate Mold (includes both train engine and carriages) with each piece measuring approximately 3cm wide x 3cm high x 3mm thick.